Fagor has some of the best looking designs that offer real value for money. The Rapida is one such brand of products from Fagor. If you are looking for the best deal in pressure cookers you must consider the 5 - Pc. 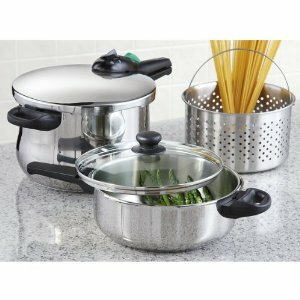 Fagor Rapida Stainless Steel Pressure Cooker Set. You get not one but two pressure cookers and three important accessories and complimentary additions that make it a great deal. Of course, if you search online you could bring down the costs further in deals or instant discounts. Besides these you also get a user manual that teaches you to use the pressure cooker effectively and a recipe book that introduces you to the world of pressure cooking and the delicious foods you can make with these kitchenware. The Fagor Rapida pressure cooker set is a perfect addition to any contemporary kitchen and also a great gift idea too. The cooking pots in this cooker are made from high quality stainless steel with mirror finish. This gives the units a fresh and new look while making them easy to clean. The unit is dishwasher safe meaning you do not have to struggle trying to clean it every day. These are not just pressure cooking pots, they can be used as regular cooking pots. The stainless steel lid and the glass lid which fit both the pots add this versatility to these pots. The unit is designed in Spain and has a bonded diffuser base. This ensures faster heat transfer and uniform heating. The unit is highly fuel efficient and can work on any heating surface. You can use a gas powered range, a coil stove or the new induction heating surfaces. Your cooker will work perfectly everywhere. These cookers also have three safety systems in place to give you the best and the safest cooking experience. You have the dual pressure control valves that help regulate the pressure inside the cooker. The dual independent pressure release valves mean that even if one gets clogged the other will help release the steam. Lastly the safety locking handle ensures that you cannot open the cooker till the pressure inside falls to normal levels. Some other incentives to purchase this already sweet deal is the instruction manual and the recipe book. Most times new pressure cooker users have a tough time figuring out how to operate it. Even if they learn, they will have even more problems trying think of good recipes to make. These two books accompanying the cooker set will ensure you will not have the same predicament. And with a 10 year limited warranty to go with all this, there is really few things you would complain about this deal. Built so well. The unit is shining stainless steel, very thick and solid. A good combo of 4 and 8 quart Pressure Cooker. If you are new to pressure cooking you can't go wrong with this set.